This is the Dutch model, without modifications. 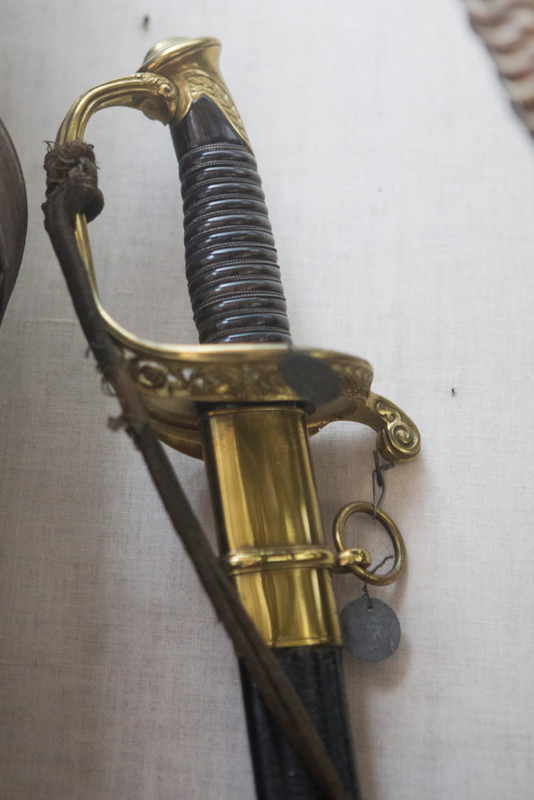 This sword was not widely used, as it was not up-to-date, even by 1830's standards, but some regiments used it for a few years after independence. Again, this model was not widely used, but was used by some Civic Guard outfits and by the Gendarmerie in 1832-33. The scabbard chape was in brass. Slightly curved (curvature = 2.1 cm), single-edged blade, without fullers. Blade length of 59.5 cm. 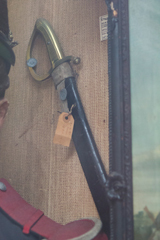 Brass hilt, cast in one piece, with a single bar guard extending into a quillon terminated in a button. 36-lines grip, riveted in its middle. Scabbard in blackened cow leather, with stitching on the reverse side. Locket with a leather thong, allowing for the fixation of the scabbard to the belt. Olive-shaped iron button on the tip of the chape. Total weight, including scabbard : 1.080 kg. On the 5th of March 1850, a model with a brass locket was attributed to the chasseurs à pied. The locket is equipped with a frog stud in the form of a shield. The total weight goes up to 1.089 kg. Around 1867, the scabbard was reinforced with an iron plate. The field artillery model has a blackened leather locket with leather thong. That of the administrative personnel, has the brass locket, onto which the iron plate is screwed. The total weight goes up to 1.184 kg and 1.193 kg. 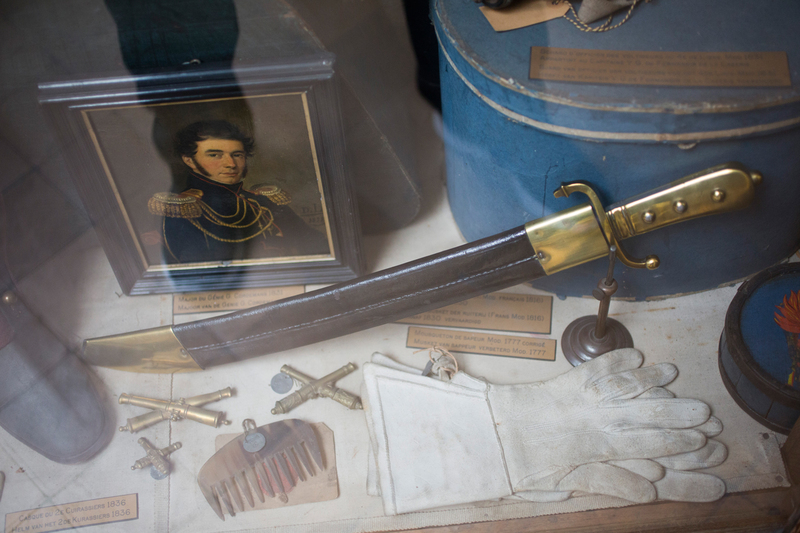 These swords disappeared from the army with the disbanding of the Miners from both the chasseurs (September 4th 1841) and the infantry (June 20th 1845). 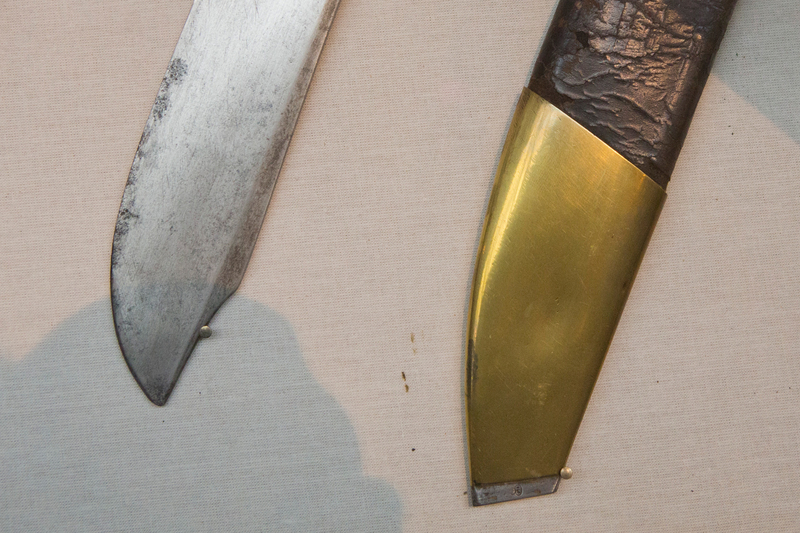 They were given to drum majors of the Civic Guard in 1845, under the name of dagger-sabers. An example of this saber pattern can be found here. Wide, slightly curved (curvature = 1.35 cm), blade, without fullers. Blade length of 50 cm. Brass hilt, cast in two pieces. The grip shows three buttons on each side and a tang button. The two buttons closer to the blade are iron rivets, attaching hilt to blade. The S-shaped guard ends	on both sides with a button. A single languet is attached to the obverse side of the guard. The scabbard of blackened cow leather has a brass locket with frog stud and a brass chape, whose top edge is cut diagonally and whose tip is reinforced with a piece of iron. Total weight, including scabbard : 1.640 kg. The royal decree of July 1st 1831 attributed a specific sword to drum majors. This seems to be the corresponding Dutch model with lion head pommel, grip and guard in copper. It is described in the royal decree of January 31st 1845 as having a straight 71 cm blade with a single fuller and square back. Copper grip, 15 cm long, with lion head pommel and half guard of 16 cm in length. The scabbard of blackened leather has a 17 cm long chrysocale locket with a frog stud in the form of a shield. The chape of same metal of 29,5 cm in length has, on top, a tip and, at the bottom, a clover ? The pommel is missing the system allowing it to be attached to the gun. The blade is 55 cm long. 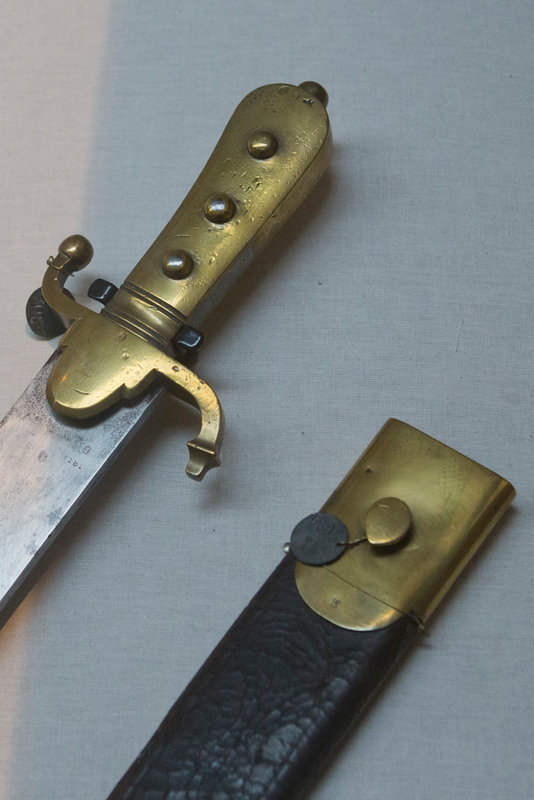 The scabbard differs from that of the bayonet only in that the locket is larger and fitted with an edge, while the hook is replaced by a frog stud. Total weight, including scabbard : 0.800 kg. 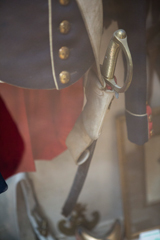 As with Cavalry officer's sabers, most Infantry officer's sabers were better made and often lighter versions of the sabers attributed to troopers. Yet, there were also a few specific models attributed to officers only. The decree of November 18th 1830 attributed to the officers of the chasseurs à pied's first regiment and to those of the engineers a special model saber already used under Dutch rule. Engraved, curved blade with two fullers. Gilt copper hilt with a straight knucklebow prolongated into a curved quillon. Croissant-shaped shell. Lion head pommel, extending along the back of the grip. Wooden, leather covered grip, bound with metal wire. Scabbard in blackened leather, locket with frog stud and chape with pointed end all in gilt copper. This saber replaced the previous, Dutch, model and is described in the Decree of January 31st 1845. Curved blade with single fuller, 77 cm long. 13 cm long, black horn grip. Blucher type guard, terminating in a quillon. Languet on each side, in the form of a shield and decorated with a hunting horn. Lion head pommel, extending along the back of the grip. All these parts are made of gilt and chiseled copper. Scabbard in blackened leather, locket with frog stud. Locket and chape both in gilt copper. The locket is 13.5 cm long and the chape 22. 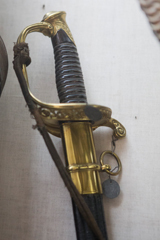 When mounted, the chasseurs used a steel scabbard. Remark : on this example, the frog stud is missing from the locket. Models worn before 1845 can be recognized by a larger blade of more pronounced curvature. The blade engraving is of an older style. The grip is often bound in shagreen and the extension of the pommel along its back is smooth. 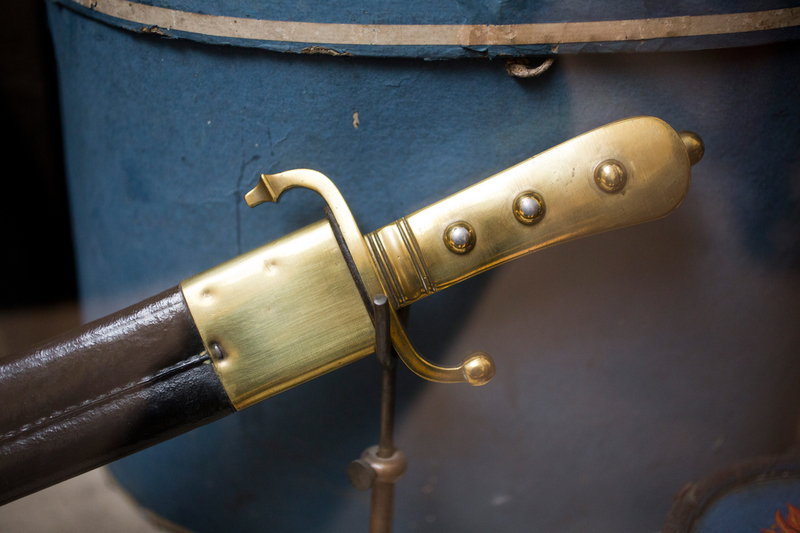 The ministerial directive of October 23rd 1833 replaced the smallsword used by non-mounted Infantry officers and the chasseurs à pied's second and third regiments by the French 1821 pattern infantry officer's saber. Curved blade with single fuller, 75 cm long. Hilt in chrysocale or chiseled and gilt copper, with two bars. The main bar extends into an oval counter-guard. This counter-guard further extends into a curved quillon. The secondary bar starts at the middle of the knucklebow, bears off on the obverse side and joins the oval counter-guard directly opposite the center of the blade. Pommel of the Phrygian helmet type (bead and half olive) decorated along its forward border with a laurel garland. Wooden, leather covered grip, bound with gilt copper wire. Scabbard in blackened leather, locket with frog stud. Locket and chape both in chrysocale or chiseled and gilt copper. The royal decree of March 5th 1850 attributed the 1850 pattern Infantry NCO's Saber to all non mounted infantry officers. Slightly curved 78 cm long blade (1 cm curvature), with 2 fullers on each side. Slightly rounded back. Hilt with a single bar in chiseled chrysocale, with a mortise for attaching the sword knot next to the pommel. The guard bar extends into an oval edged counter-guard. This counter-guard further extends into a curved quillon. The reverse side of this counter-guard is plain, but the obverse side is decorated with a pierced design of branches and scrolls. Horn grip bound with gilt copper wire. Scabbard in blackened cow leather with a square browned chrysocale locket. Frog stud and loose ring attached to the locket, with another loose ring attached to the lower scabbard fitting. Both rings and frog stud in chrysocale. Locket and fitting length respectively 8 and 3 cm. Scabbard chape in browned chrysocale ending in a steel olive-shaped button. Total weight, including scabbard : 1.225 kg. The same decree attributed a new saber to the mounted officers of the Engineers and Infantry. Straight, 86 cm long double-edged polished blade, with 3 fullers on each side. Only one edge is sharpened. Carp's tongue tip. Hilt identical to that of the NCO's saber. Steel scabbard fitted with locket and two loose rings, all in steel. Symmetrical steel shoe. 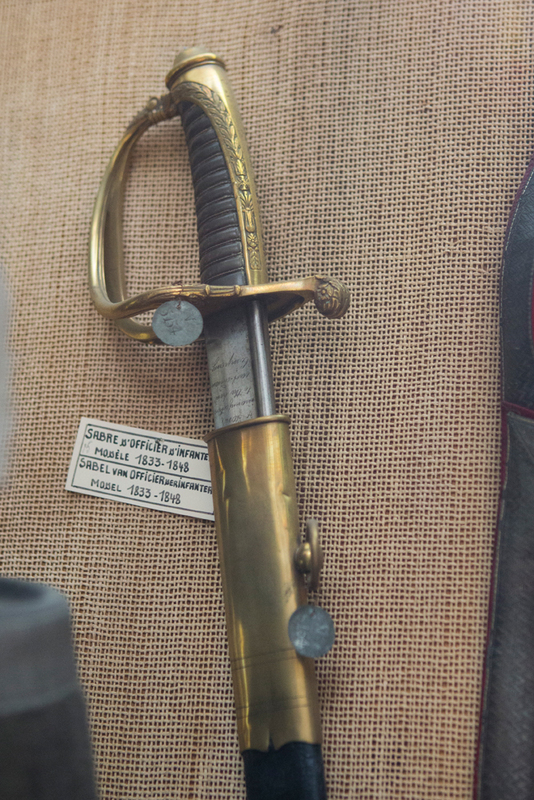 This saber was also attributed to the officers of the chasseurs-eclaireurs by the decree of July 15th 1867. To make things simple, this is the French 1845, not 1850, pattern sword. 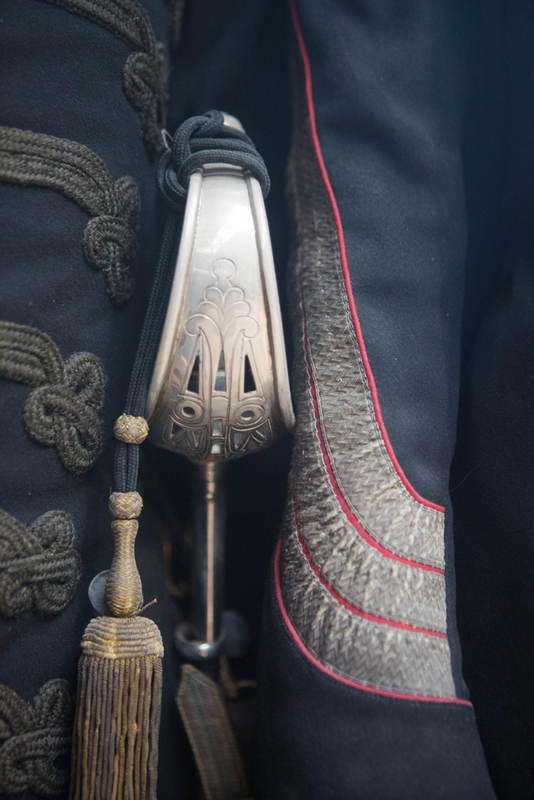 The decree of June 18th 1848 describes this sabers as differing from the French 1821 pattern only in that the scabbard fittings are composed of a locket and bracelet in chrysocale, both fitted with a loose ring, and that the chape is made of the same metal. 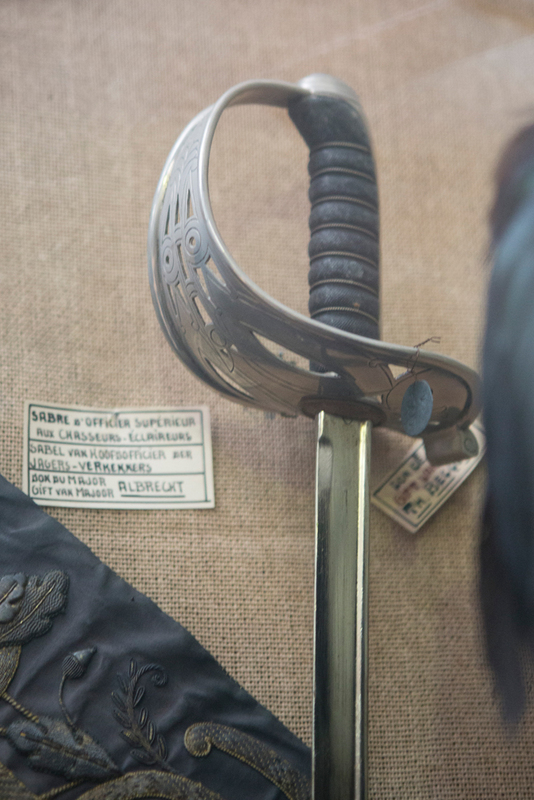 This saber is described by the decree of April 21st 1867. It differs from the Chasseurs-Eclaireurs Officer's Saber described further on only by a second bracelet with loose ring on the scabbard. The royal decree of November 17th 1881 describes this sword as the Belgian 1850 pattern army sword, without the lower scabbard fitting. The royal decree of July 17th 1883 prescribed that this lower fitting (without loose ring) was to remain on leather scabbards and that all fittings were to be nickel-plated chrysocale. The royal decree of November 17th 1881 describes this sword as the one in use for equivalent army rank, but without the lower scabbard fitting. Again, the royal decree of July 17th 1883 prescribed that this lower fitting (without loose ring) was to remain on leather scabbards and that all fittings were to be nickel-plated chrysocale. This saber was also worn by some NCO's (adjudants sous-officiers) of the same corps, while the other NCO's used a version with curved blade and blackened leather scabbard, with nickel plated fittings. As of June 15th 1867, these officers received the Belgian 1850 pattern Infantry Superior Officer's saber. 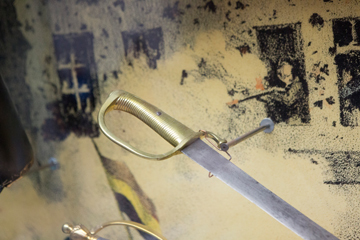 On February 9th 1891, the minister of the interior adopted a new saber for the officers of the chasseurs-éclaireurs. 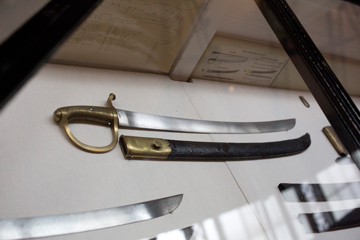 Straight blade, similar to that of the 1889 pattern sword. The hilt in steel plate is engraved and may be chiseled. It is composed of a main bar extending into a shell and a pommel extending along the back of the grip. Grip in horn or wood, covered in shagreen and bound with a silver gilt metal wire. Steel scabbard, similar to that of the 1889 pattern sword. 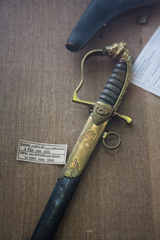 The decree of June 18th 1848 attributed a new saber to the officers attached to the superior staff of the Civic Guard, who had so far used the Montmorency saber with gilt hilt. The Decree of July 17th 1883 attributed this new saber to the whole of the general staff. This sword is (barely) described in the Bulletin Officiel of the first and second trimester of 1905. Steel hilt. Steel scabbard with two loose rings placed just under the hilt. The ministerial directive of January 18th 1889 replaced both these sabers with the 1889 pattern Infantry Officer's Saber, effective January 1st 1891. Straight, single sided, blade without fullers. Rounded back and length between 80 and 90 cm. Carp's tongue tip. Hilt with four ornate bars in chiseled chrysocale. Edged shell. Mortise for attaching the sword knot next to the pommel. Red felt washer. Wooden grip with a square section, covered in shagreen and bound with gilt copper wire. Beaded pommel. 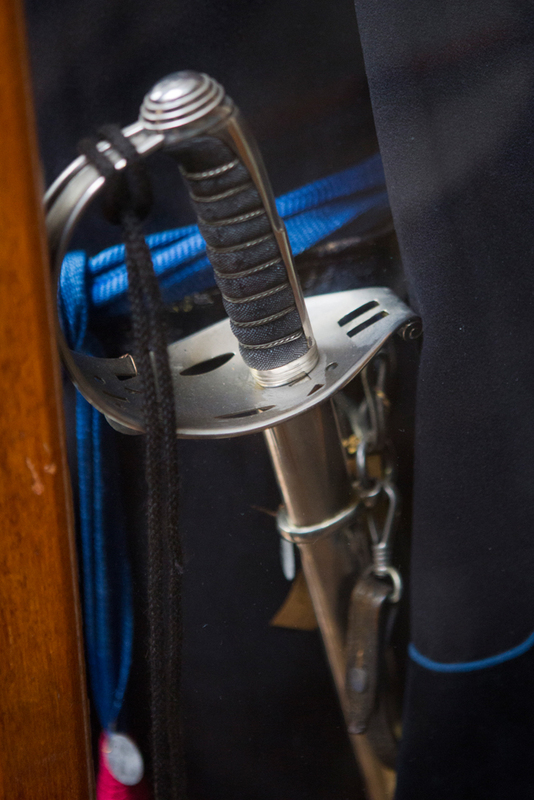 Nickel platted or polished steel scabbard with wooden inserts. Flared mouthpiece, single fitting with loose ring and mortise. Asymmetrical shoe. Total weight, including scabbard : between 1.100 and 1.300 kg. The template sabers were created by the Fonson company, but several other private companies created such sabers. Due to this, very few officers actually carried a sword totally coherent with the standard pattern. Sabers are often found with a hunting horn chiseled onto the shell. 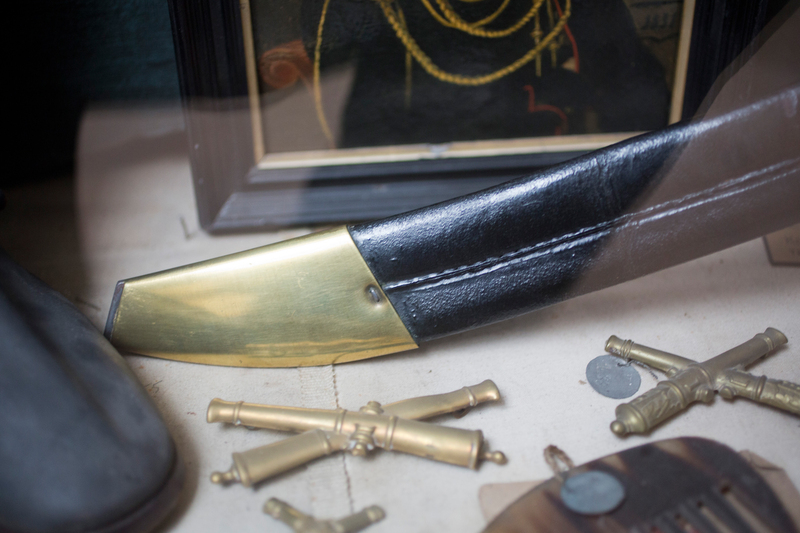 These belonged to carabineer officers. In grenadier's outfits, some officers carried swords with hilt reminiscent of that of the French saber for mounted Carabineers of the first empire. There also exists so called 'de luxe' examples, with lion head pommel, extending along the back of the grip and decorated with the arms of the 9 Belgian provinces. The bars are heavily decorated. Examples of this saber pattern can be found here, here, here and here. 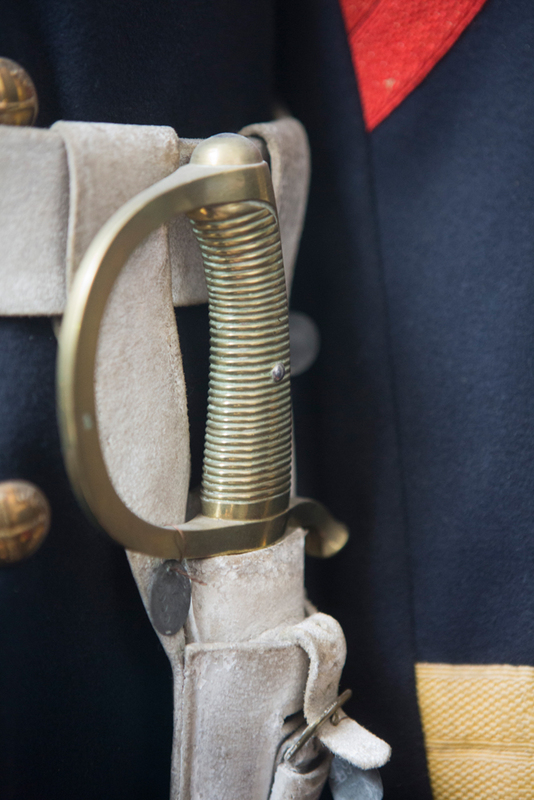 Some NCO's (adjudants sous-officiers) used to wear the same sword as officers, but kept the 1850 pattern Officer's sword when officers switched to the 1889 pattern. 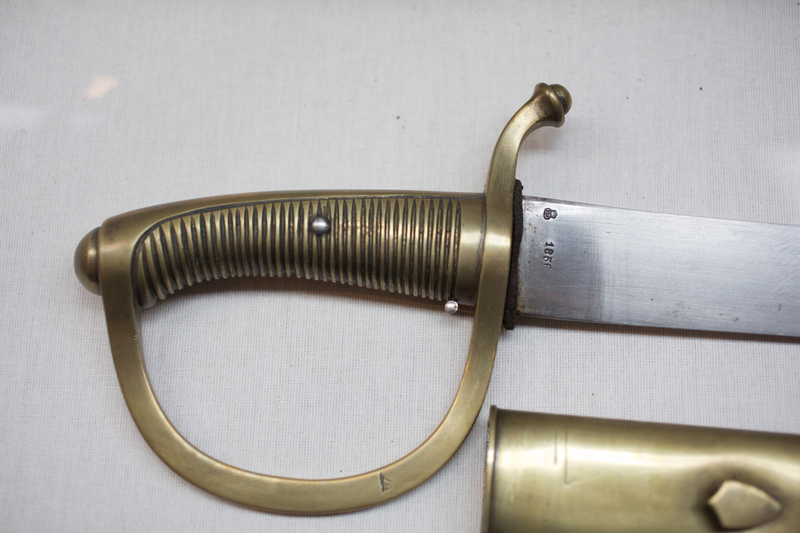 This is the 1889 pattern officer's sword, but with a nickel plated hilt. Harold L. Peterson & Stephen V. Granscsay's 'The American Sword 1775-1945' for the description of a few French pattern swords.